East vs West, the upcoming spin-off of Paradox's Hearts of Iron series, sets you on the brink of global thermonuclear war in an era when a small tip in the balance of power could have ended civilization as we know it. No pressure. 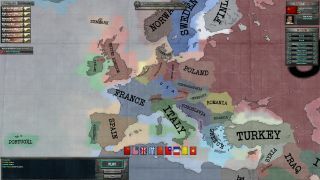 Spanning the tension-laced years between 1946 and 1991, the game will allow you to play as any nation on earth as you manage military, economy, political clout, and espionage to gain influence in the nuclear age. Check out the video above for a quick briefing. I don't say this lightly: I was pretty blown away by the level of detail in East vs West's simulation, which actually tracks the population of your holdings down to individual people. Citizens in East vs West are further subdivided into age brackets, which can affect things like drafts. Being at war for a long time is going to deplete your supply of healthy, young adults, forcing you to expand the parameters and start putting guns in the hands of the middle aged and elderly. Of course, you don't always have to risk the lives of your people. If you don't get caught, funding and supplying guerrillas in your enemy's territory can be very effective... in the short term. Waging constant war isn't always the best option, of course. The United Nations allows groups of like-minded leaders to band together and impose economic sanctions and other restrictions on nations that are being bullies. There's also a Doomsday Clock mechanic, based on the real-life one , and it marks how close humanity is to destroying itself. Once the clock strikes midnight, it will be too late to back down from full-scale war through diplomacy. Thus, players wanting to avoid Armageddon will be forced to win their victories in the shadows. The espionage system is presented as card game, with each spy in your employ having certain capabilities from gathering intel, to sabotage, to assassination, to counter-spying. Politics and technology, as you'd expect, also play a significant role. There's an immense amount of technological progress covered in the game's 45-year span, and being the first to hit big milestones—satellites, computer networking, and so on—could position you to be the dominant world power. You'll also be able to participate in the space race, and reap unstated rewards if you win. All the while, you'll be setting policies and monitoring the opinions of your populous. In democratic nations like the U.S., this is especially important, as a president who disagrees with your playstyle being elected could throw a wrench in your plans. Of course, in cases like these (as the devs pointed out), there's always the Grassy Knoll option. Too soon? East vs West is scheduled for a Q2 2013 release.